Each year, some right whales migrate south to the waters off the southeastern U.S. Some go there to calve, but increasing numbers of juvenile and adult male whales have also been seen there in recent years. The New England Aquarium is contracted by the National Marine Fisheries Service to provide near real-time right whale identification support for the many teams surveying right whales in this region. These teams include the Associated Scientists at Woods Hole, Duke University, Florida Fish and Wildlife Conservation Commission, Georgia Department of Natural Resources, Marine Resource Council, Northeast Fisheries Science Center, Pennsylvania State University, Sea to Shore Alliance, and University of North Carolina- Wilmington. In recent years, matching has been a challenging job with over 200 whales seen in some years. Two mother calf pairs swimming off the southeastern U.S. in 2009. This year has been much quieter. Although the surveys are still underway and will continue until the end of March- with some in the mid Atlantic going into April, we have identified just six mother/calf pairs and 61 other whales. The calf count so far is markedly lower than it has been in 12 years. The right whale population has shown remarkable fluctuations over the 32 years we have been monitoring them. Such fluctuations are somewhat expected in any small population (called stochasticity), but can be heart breaking to witness for all who care about this species survival. The most challenging time previously was in the late 1990’s when whales looked to be in poor health (thinner and with deteriorated skin condition) and the calf count steadily declined for three years from the average of 13 to only five, four and one in 1998, 1999, and 2000 respectively. Having recently seen some whales presenting unhealthy skin, and unusually low numbers in the Bay of Fundy in 2010, a number of us are concerned that the population may be heading into another hard time. Their skin has not looked as bad as it did in the late 1990’s, so I am hopeful this will be a shallower and shorter dip in calving. Time will tell. 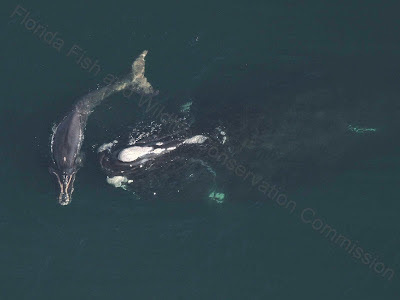 Half Note and her calf during their last sighting off the Florida coast January 10, 2012. Photo courtesy of the Florida Fish and Wildlife Conservation Commission, NOAA Research Permit #15488. Sadly, one of the six known moms has already lost her calf. This whale, known as Half Note (Catalog #1301), gave birth to her 5th calf this last December, but the calf had died by January 24th. When last seen, the calf looked quite thin, suggesting that something was hindering its feeding. This mom has had a history of reproductive trouble. She lost her previous two calves while on the calving ground in 2008 and 2006 and her first calf from 1989 seems to have only survived for two years- though no carcass was ever discovered. The cause of this reproductive trouble is unknown. Interestingly, after she lost her calf this year, she started associating with an old friend. She was seen with whale #1158, another adult female who has a poor reproductive history. This pair was seen together for eight months in 1997/1998 and for seven months in 2000/2001. In both cases, they were seen off the southeastern U.S. in years when Half Note could have given birth (but this was never witnessed) and they had migrated north to the feeding grounds off of Massachusetts. 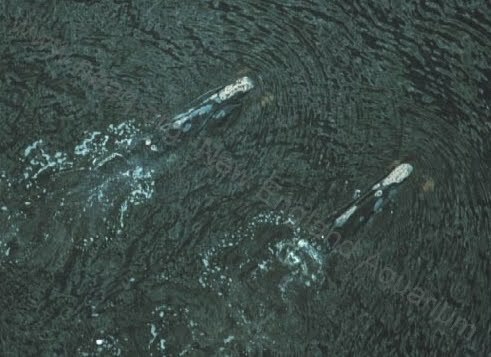 Such long term associations are very rare in right whales (other than mothers with their calves) and make us wonder more about what role relationships play in the right whale community. Will these two be seen together off of Massachusetts in the spring? Will many more calves be born later in the season, or discovered on the feeding grounds? Stay tuned for the answers. Labels: Calving Ground, Philip, southeast U.S.